Here are top things to do and see in the chic seaside resort of Deauville in Normandy. The perfect seaside destination for a short break, there's always something to see or do, winter and summer. Deauville beach is a 2-km (1.5-mile) long stretch of soft golden sand and gently sloping shoreline. It’s covered in brightly colored parasols placed with military precision on the freshly swept and cleaned sand. Hire a parasol and deckchair or mattress for a day, week or month and you’re all set with an attendant who goes with you to untie your parasol and help set up all your gear. The 634 meter-long boardwalk, made of red ironwood and built in 1923, is lined with beach cabins, each named after American actors and directors who have come to the resort's American Cinema Festival since 1975. Above the cabins on the beach side, an annual photographic exhibition displays large, historic images of the resort. You can also hire one of the cabins inside the Art Deco-style bathing building just set back from the beach. The concrete and mosaic-tiled cabins opened in 1924 and were the dernier cri in modernity. A series of charming small courtyards with fountains in the middle, you can hire one of these cabins and take a shower here. One final great idea is the media library set in a smart wooden hut where you can borrow a book for the day for free. Horse racing in Deauville dates back to 1863 when horses and riders pounded along the beach on a temporary track. A year later, the Deauville-La-Touques racecourse (45 Ave Hocquart de Turtot) was built and opened, as the locals will proudly tell you before the church was built. One of the most beautiful and leading flat racecourses in France, it attracts international trainers, horses, and jockeys to its summer and winter seasons. It’s not for nothing that Deauville is twinned with Lexington, Kentucky. A day at the races here is remarkably cheap in July and August and free for the rest of the year’s racing. The second course at Deauville-Clairefontaine (Route de Clairefontaine) is just to the east of the town with racing in June, July, August, and October. Race meetings take themes, perhaps ecology or the local region, with plenty of related events to keep the family entertained. And it offers three different kinds of racing: flat, trotting and steeplechasing. Like Deauville-La Touques, it’s just a few euros for entry. Deauville has the oldest polo club in France (25 ave de la Republique) and real kudos in the polo world. Of all the European venues, this is the one where the Argentinian teams (the best in the world) want to win. Polo is a great sport – expensive to play but cheap to watch. Polo has been played in Deauville since 1892. But it wasn’t until 1950 that the Gold Cup, which concludes the world championships, was established. It’s a great sport to watch from the small charming pavilion at the club, which is conveniently a few hundred yards from the main racecourse. So you can enjoy an afternoon’s racing, then go over to the polo ground for the 5.30 p.m. matches. In 1912 a grand plan of Deauville was inaugurated with the opening of three iconic buildings: the Hôtel Normandy and the Hôtel Royal with the Casino strategically placed between them. They made a trio of luxury buildings designed to attract chic Parisians and the milords of British high society. The hotels, both part of the prestigious Barrière group, are grand in the best possible old-fashioned way. Huge entrance halls, long corridors, high ceilings, and spectacular public rooms make the perfect place for a drink. With such a captive audience, it’s no wonder that shopping in Deauville is so good. Many of the top French names have shops here with the added advantage of being close together and open on Sundays. Coco Chanel came to Deauville in 1913 to be with her lover, Boy Capel. Inspired by the clothes that she saw on the racecourses, golf courses, beach, and the yachts, she designed a range of casual, wearable clothing and opened her boutique in 1913 here. If you’re a market fan, the fish market and the covered market is a must. They are surrounded by street stalls and take place daily in high season and regularly throughout the rest of the year on Tuesdays, Fridays and Saturday mornings. You’ll find it in the Place du Marche, just off the main Place Morny with its pavement cafes and avid people watchers. Also worth noting is the once-a-year massive bric-a-brac and antique fair that takes over the Deauville-La Touquet racecourse for a weekend in May. You'll get great bargains at this enjoyable event. 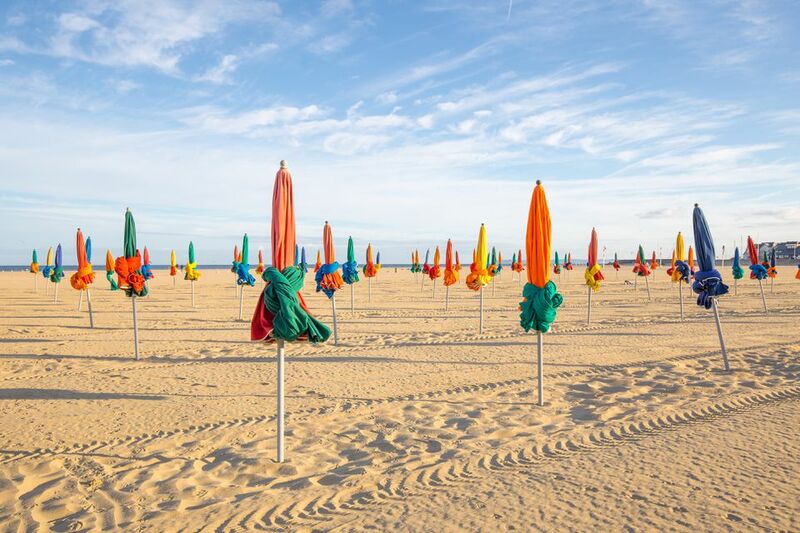 Since the arrival of mayor Philippe Augier, Deauville has become a major player in cultural events, making the cultural scene a year-long attraction. They happily include the unexpected, like the Planches Photographic Exhibition which is an intriguing idea that brings everybody in. On the October night that the clocks go back, that elusive extra non-hour is spent by the hopeful going into the streets to photograph Deauville. The judging takes place at 1 am and the photographs go up in a local exhibition. There's plenty of music on offer as well including summer music on the beach. At Easter, the Festival de Pâques features young unknown classical music virtuosos, and there's another chance to hear young talent in August with concerts in the impressive building which normally holds auctions of thoroughbred racehorses.